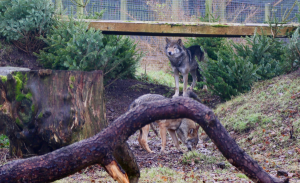 Two European wolves have been introduced to their new home at Camperdown Wildlife Centre in Dundee. 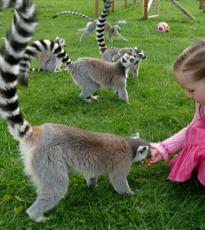 Aurora and Loki were released into their enclosure at the centre on Tuesday morning and have already settled in well. Visitors to the centre can now see the wolves in their new surroundings and we hope they will be very popular with locals and tourists alike. The wolves are pure European wolves and staff at the centre are hopeful that they will contribute to the European breeding programme. The female was born in June 2013 at the Highland Wildlife Park in Scotland and the male was born in May 2012 in the Netherlands. The female is called Aurora and the male has been named Loki. European wolves are native to Europe and the central and southern steppe zones of Russia. European wolves can be found in many areas where their food can be easily hunted, from high mountain slopes and forests to lower temperate grasslands. They are the largest of the grey wolves with their fur being relatively short and coarse. The howl of these wolves is much more melodious and quieter than that of their North American grey wolf cousins. Many European wolf populations are forced to live largely on farm livestock and rubbish in areas with dense human towns, although wild animals such as moose, red deer, roe deer and wild boar are still their most important food sources in the more mountainous regions of Eastern Europe. Other prey items hunted by these wolves include reindeer, mountain sheep, bison, ibex, chamois and wild goats. There are many tales of when the last wild wolf was killed in Scotland, but official records indicate that the last wolf was hunted in Perthshire in 1680. In ancient Scotland, wolves were considered such a threat to travellers that special houses called spittals were erected on several remote highways for protection.